Dusting off an old prototype which procedurally generates non-realistic / fantasy / alien trees. For this demo I created a UI interface to allow control of the generation parameters. Be warned - the algorithm is still a work in progress and consequently some parameters may have no effect (though I tried to remove anything redundant) and some may cause very strange behaviour! The style is inspired by vintage sci-fi artwork and Dr Seuss illustrations. Planning to improve on it for the duration of the jam. 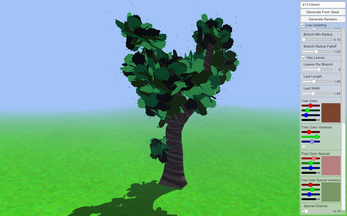 Use the control panel on the right to change the tree generation parameters. A seed can be entered in the top text box or random seeds can be generated. The Live Update option refreshes the mesh whenever a parameter is changed. Windows/Mac downloads: simply download and extract the zip file, then run the .exe file (Windows) or .app file (Mac). The tree branches are generated using a recursive algorithm, which uses Unity's Mesh class to build the geometry vertex by vertex, polygon by polygon. The tree texture is generated using layers of algorithmic patterns. 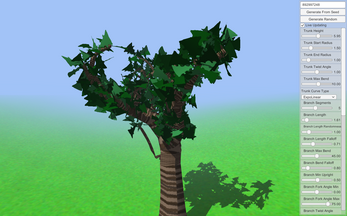 The leaves are flat polygons with a cutout shader applied. Bezier curves with random control point positions are used to generate the leaf textures. 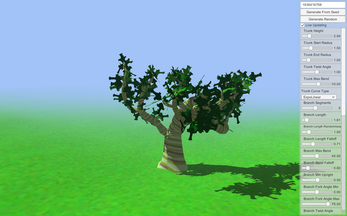 The terrain is also generated procedurally. 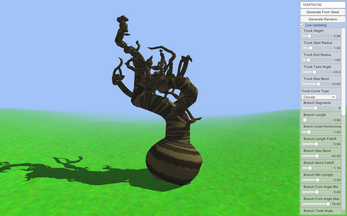 This implementation uses Perlin Noise for that smooth rolling hill effect. Update 0.2 - Generator Controls and Live Updating! I'd suggest also mirroring the source repo to Github. Myself (and I presume others) often find interesting projects via Github's social and search functionality. Gitlab and Bitbucket don't currently have the critical mass for them to be worth checking in this way. Even if you prefer a different Git hosting service it might be worth also having a Github presence just to make it easier for people to find you. You can probably set the mirror to auto-update so it shouldn't need extra work once you've set it up.